To understand what’s so special about Mignatti Companies™ Communities, it helps to look back, across four generations, to where it all began. 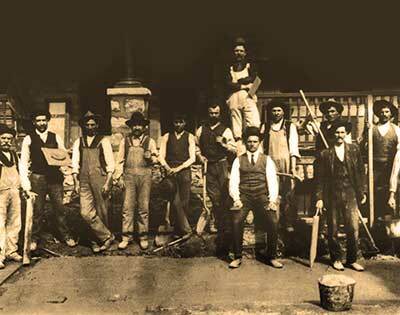 In the early 1900's, a young man named August Mignatti – a builder by trade - launched a company to provide home building, masonry, and road construction services in the Philadelphia area. Having learned the builder’s craft from his father, Theophile, young August had an ambitious streak, as well as a natural inclination toward hard work, innovation and accomplishment. Over time, his trademark would become his dedication to exceeding the expectations of his customers. Three more generations of the Mignatti family followed in the footsteps of their patriarch, never losing sight of the original Mignatti vision: to build fine homes of lasting quality. Thus was preserved Mignatti Companies' signature Old World work ethic, proud craftsmanship, and lasting dedication to satisfying customers. The spirit and energy Mignatti devotes to residential and commercial construction has kept this tradition alive. Whether building homes for the first-time buyer in the suburbs, restoring historic residences to their former beauty, or managing condominium conversions, the family’s values have remained solidly rooted in excellence. Now in the 21st Century, the Mignatti Companies™ family is focusing our skills and energy on the development of communities exclusively suited to today's lifestyles. Built with pride, these thoughtfully designed homes offer an uncommon blend of Old World craftsmanship, attention to fine detail and state-of-the-art construction techniques … the same lasting foundation upon which, more than a century ago, the Mignatti name was built.